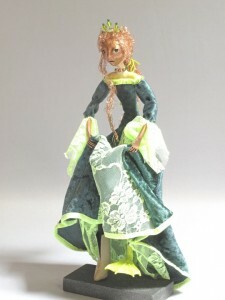 Vasilisa the Frog Princess is my latest art doll sculpture. I wrote last time about doing some research into fairytales, and the Frog Princess was the first to catch my eye. I had heard the tale of the Frog Prince, but had not encountered his feminine variant before. This intrigued me. Her name is Tsarevna in some of the tales I read. The name Vasilisa actually appears in several different tales of primarily Russian origin. In many there is no mention of her having amphibious qualities. In one very Cinderella-ish version, complete with evil step mom and sisters, she is a girl with a magic talking doll that aids her. In others she is a true princess that has been bewitched. In another, she is actually a frog that is then transformed. Usually, some great skill at accomplishing tasks (with and without magical help) is what distinguishes her. I captured my Vasilissa mid transformation from frog to princess. She appears just a bit surprised that her left leg hasn’t yet caught up to the rest of her yet. I enjoy the interplay between the fact that many characters in fairy tales, and frogs themselves go through major metamorphosis. I’m sure this symbolism was not lost on the original authors of the tales as well. I hammered a copper face and copper hands, and torch flame enameled brass brads for her eyes. Her head, upper torso and left leg are sculpted out of paperclay over a wire armature. Vasilisa’s hair is copper rooted to a copper scull cap that was glued in place. Her costume I created from some wonderful velvet and lace scraps in my cloth bin. This art doll figure is secured to her base. This choice was necessary for the Vasilisa sculpture so that she could stand and hold up her remaining frog leg to get a look at it. This entry was posted in Art Dolls and tagged art doll, copper, figure, figure sculpture, frog princess, mixed media, one of a kind, sculpture, Vasilisa on August 21, 2015 by lynnadmin. 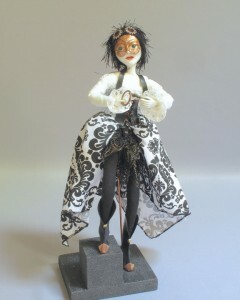 This week’s completed art doll is a mixed media sculpture titled, “Key”. With this piece, I continue to work to stretch my figures to possess a narrative of their own. Key is obviously a steampunk adventuress in the middle of some important and exciting task. No, I do not know what the key she is holding opens or secures, or why she looks so thoughtful as she holds it. Those questions are hopeful for you the viewer to answer for yourself. I chose to once again vary my construction techniques and media choices with this art doll. Many viewers see the hand hammered copper faces I create for many of my sculptures as them wearing masks. With this doll I chose to actually make the copper be a mask over a paperclay sculpted face. I also chose to extend the paperclay sculpted part of the figure to include her shoulders and top half of her torso providing her with a more defined shape. I sealed but did not paint most of the paperclay to leave it with the appearance of a porcelain bisque piece. I like how this augments her steampunk/neo-victorian styling. My pre-sculpting research this week has drawn me deeper into the world of fairytales. I find that I am not drawn to the well known princesses and characters that have been Disney-fied and rehashed into very specific images in our common imaginations. I have instead looked to some more far flung and bizarre tales for inspiration, as if talking animals, fairies, and magic spells weren’t strange enough to begin with. They are all in the very beginning and sketch stages, but I will hopefully have a few to share with you shortly. It is interesting that these sculptures start in an opposite position from the art doll Key above. She is a character that I have created and provided with gesture to imply that she is part of some tale. The new art dolls I am working on, start with a tale from which I will try to generate my vision of the character. This entry was posted in Art Dolls and tagged art doll, copper, figure, figure sculpture, key, mixed media, one of a kind, OOAK, sculpture, steampunk on August 5, 2015 by lynnadmin.